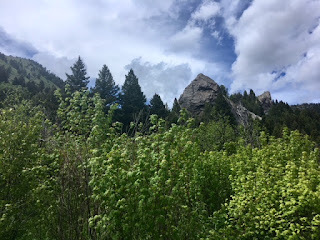 We headed to Bozeman on Friday to watch a Shakespeare in the Park play—but since it’s mountainous, and since Dex lives there, we also planned to take a short hike and to see our boy. First was the hike (Middle Cottonwood Creek Trail), and not to be obnoxious, but it was not that exciting by Montana standards. Still, if you lived in Bozeman and had this right in your backyard? That would be neat. Then we picked up Dex, said hello to his cat and one of his buddies, and had a tasty dinner. It is always fun to catch up with Dex, as he loves his job/classes/town/house/cat/friends/life, and honestly what more can you hope for as a parent? Unfortunately, at 30 minutes to Shakespeare showtime it was pouring down rain. The good people of Bozeman were heading over there anyway with umbrellas, but we had two raincoats between the three of us and no desire for two hours of wet shivering. So we dropped Dex off and headed home. We’ll have to catch the play at some other venue if we can work it out. I woke up the next day in PAIN from the short hike—I’m afraid that spending December through May sitting at my desk 10 hours a day has dragged me to new depths of out-of-shape-ness. Seriously, both this and pain from the first two weeks of swimming were no joke; I must be a mess physically. I’m going to need to think hard about what I’m doing for exercise these days and probably step it up a bit. Outdoor 6 a.m. swimming got off to a ROUGH start, honestly; all I’ve wanted to do for the couple of weeks is go lie down. Like, no matter what time it was or what I was doing. It was so bad that I was delighted on Monday to have a dental cleaning—30 minutes of scheduled midday horizontal passivity, hooray! Not to mention my neck got horribly sore for some reason that must be related to either really weak muscles or really bad form. But the exhaustion and the neck pain are both lifting, and swimming feels a bit more normal, and the walk home is no longer finishing me off completely. Plus, now that the water temperature at the pool is reliably good, the morning exercise and sunshine are really nice. It seems the last remaining problem is that I am tragically slow and can’t do even a full 50 meters of butterfly, but that can hardly be considered a problem, since I don’t really have any goals for this other than morning exercise and sunshine. So for June…I recently had the thought that if I just did one small house-cleaning task every single day, it wouldn’t take any significant time (and might actually make a nice break from desk work), but I could actually get a lot done over time. I started doing that a few weeks ago, but I think I’ll call it my June habit. Every time I notice some small thing that needs to be taken care of, I put it on my calendar for the next available day. (And the things on my list all take about five minutes or less—so not “clean downstairs bathroom,” for example, but “clean downstairs toilet.”) This seems to work really well for me, or at least I’ve done every single thing on my calendar so far and made the house noticeably more pleasant to live in. The pool heater is fixed, and the water temperature was pleasant. The horrifyingly nasty locker rooms have been demolished and are being replaced with shiny new ones, which means I’ll be able to take an actual shower after swimming when they fully open in few days. The walk home gave me time to listen to an entire hourlong podcast, which I had been missing more than I realized. My shoulder is 100 percent again, so I’ve decided to commit to doing around 30 minutes of whatever the actual workout is, rather than just dinking around. Swimming hurts SO MUCH. Not in an “injury” way, more in a “you’re 47 and have not swum in 10 months” way. Even walking hurt—in a “you aggravated your Achilles tendon a bit last week while running and it’s not going to let you off the hook just yet” way. I came home happy (though in pain, truly), and when Mik came home a bit later, it was that much easier to talk to him for having spent 45 minutes in his world. I earned the title "Ironmom" in 2011 (read all about it below), but these days, usually I just go by Julie.